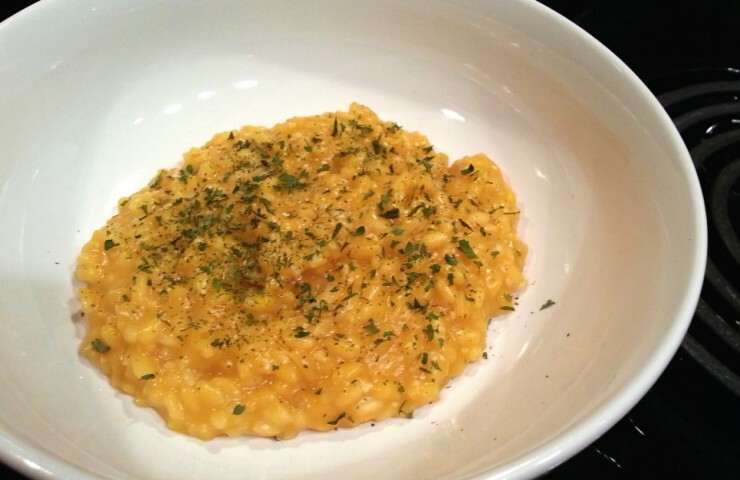 Risotto used to be a dish I only ordered at a restaurant because I was intimidated to make it at home. 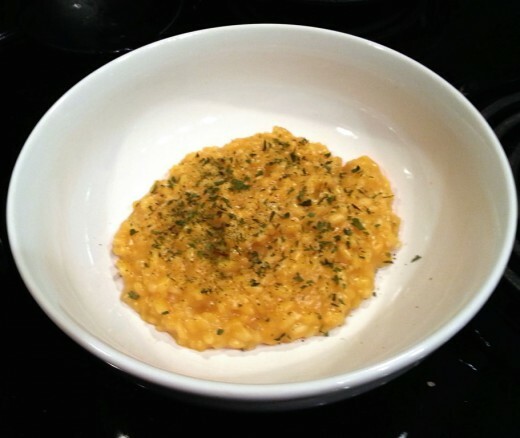 I thought it would be difficult, time-consuming, and would not come close to resembling real risotto. I’m not sure why I decided to finally give it a try, but I’ve now made risotto twice, and both times it has turned out perfectly. Now I should warn you in advance, this is not a “throw everything into a pot and let it simmer” type of dish. 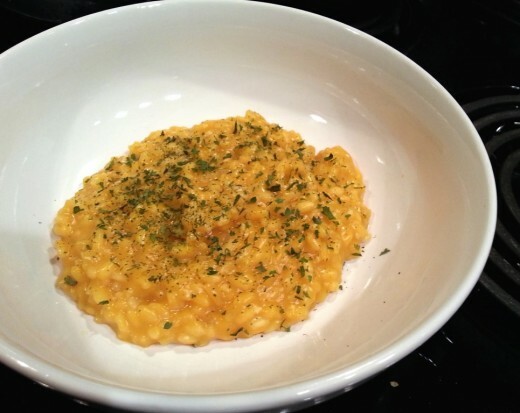 Risotto does require a little time and effort to achieve the perfect creaminess and texture, but I can assure you it’s well worth it. I would just avoid making it on a night when you’re hoping to get dinner on the table in 10 minutes. To begin, heat 1 cup of butternut squash puree and 3 cups of chicken broth to a boil, then reduce the heat and let it simmer. Side note: To make butternut squash puree, preheat the oven to 400°F. Peel a butternut squash and cut it in half lengthwise. Remove the seeds, then cut the squash into cubes. Lightly toss in olive oil and season with a little salt, pepper, and cinnamon. Transfer the squash to a baking sheet and cook for about 35-45 minutes, until the squash is soft and fully cooked. Let cool so it’s easier to handle before transferring to a blender or food processor. Add in a little milk if needed and blend until smooth. If you’re looking for a quicker alternative, visit the freezer section of your local grocery store and purchase a bag of frozen butternut squash. Cook according to the instructions on the package prior to processing or blending. In a large saucepan (I love using my Le Creuset cast iron saucier), heat 1 teaspoon of butter over medium heat. Add 2 cloves of minced garlic, 1/2 cup of diced onion, and 1 cup of arborio rice. Cook and stir for about 2 to 3 minutes. Then add in 1/4 cup of dry white wine and cook until absorbed. Now comes the tricky, time-consuming part. Add the broth mixture to the rice, one ladleful at a time, while stirring frequently. Wait until the broth mixture is completely absorbed in the rice before adding another ladleful. Continue this process (it’s really not that bad I promise) until all of the broth is incorporated and the sauce is creamy, about 30 minutes. Remove from the heat and add in 1/2 cup of grated cheese. Parmesan is probably the best choice because the saltiness balances the sweetness of the squash, but last time I used shredded Gouda and it tasted great. Season with salt and pepper and lightly fold in freshly chopped parsley, leaving a tad for a garnish on top. If you’ve ever been intimidated by this dish like I was, I hope this recipe provides some hope and maybe even inspires you to give it a try. Enjoy! Heat broth and butternut squash puree to a boil. Reduce heat, and let simmer. In a large saucepan, heat butter over medium heat. Add garlic, onion, and rice. Cook, stirring often, for about 3 minutes. Add in wine and cook until absorbed. Add 1 ladleful of the broth and squash mixture to the rice. Stir gently until the broth is absorbed. Then add another ladleful of the broth, and stir until absorbed. 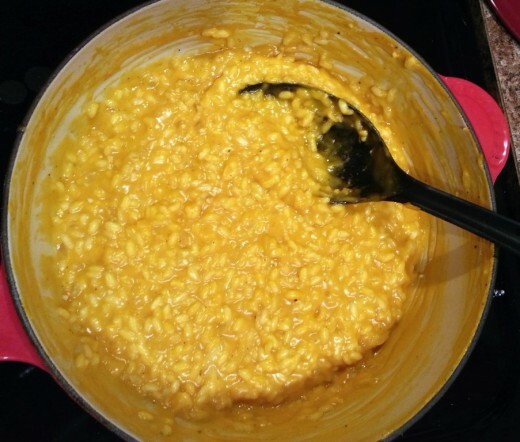 Continue this process until all of the stock is incorporated and the rice is creamy, about 30 minutes. Remove from heat and stir in the cheese. Lightly fold in fresh parsley and serve.